Las Vegas Wet. Used with permission. Special Note. It's not open yet! Note that according to its developer, the Las Vegas Wet Indoor Water Park Resort and Casino was scheduled to open in 2013. Calling the project's viability into question, the ambitious plans have changed a number of times, and projected construction and opening dates have been pushed ahead a few times as well. While it might still open, it is looking less and less likely. Las Vegas, Nevada. The exact site has not been specified, but the developers say that it would be located off of the Strip, close to the 215. When (and if) built, the enormous indoor water park would be the largest in North America and the second largest in the world. For more on big indoor water parks, see A Lotta Water: Who Has the Biggest Indoor Water Parks? The water park would be open to registered guests of the resort's two hotels, and it would offer day passes to the general public based on availability. 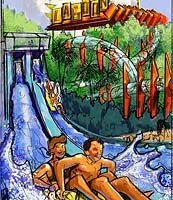 According to its developers, the park would include: a pneumatically powered water coaster, FlowRider surfing attraction, family raft ride, lazy river, tube slides, body slides, interactive play structure with dump bucket, chidlren's activity pool, wade-up restaurant, and whirlpool spa. In addition to the indoor water park, the resort will offer a 23-acre outdoor water park with a Flying Reef surfboard attraction, lazy river, tube slides, body slides, chidlren's activity pool, and whirlpool spas. The property will also feature a yet-to-be-named 65-acre theme park, an indoor snow dome (! ), a casino, an "America in Miniature" park, two entertainment/restaurant/nightclub areas, an arena, a spa, and a multiplex cinema. Want to learn more about the rides that would be coming to Las Vegas Wet? Read these reviews of similar attractions at other indoor water parks. According to its developer, Las Vegas Wet would be an enormous indoor and outdoor water park complex with a variety of planned themes, including the "future retro" Luxe Lagoon, the Painted Desert Oasis, the Vintage Vegas, Glacier Bay, and the Hidden Riviera. Given its size, it's no surprise that the parks would feature a generous array of attractions including a FlowRider surfing attraction, a family raft ride, a lazy river, and a whirlpool spa. It would also offer a couple of unique water park attractions, including an indoor uphill water coaster that would be powered by pneumatic blasts of air, and an outdoor Flying Reef surfboard attraction that would measure 100 by 300 feet and generate a steady curling wave for surfing. In addition to the indoor and outdoor water parks, the audacious Las Vegas Wet Resort would include a 65-acre theme park (the details of which have yet to be released) as well as an "America in Miniature" park that would showcase scale models of famous U.S. sights such as the Empire State Building and the Gateway Arch. Since this is Vegas, it should come as no surprise that the resort would include a casino. It would also offer two entertainment/restaurant/nightclub areas, an arena for sporting events and concerts, a spa, an arcade and family entertainment complex, and two hotels with a total of 1400 rooms. One hotel would feature a Grand Canyon theme, and the other would sport a Swiss chalet theme. Perhaps the wildest feature of the resort would be an indoor snow dome (keep in mind that this will be in the middle of the Las Vegas desert) with year-round Alpine skiing and snowboarding.